Following on from the terrorist attack on the Church of Saint Etienne-de-Rouvray and the murder of Fr Jacques Hamel on 26 July, religious leaders from several faith traditions held a prayer vigil outside the Cathedral on Sunday 31 July. They came to express solidarity with Catholics and all people of faith. 'We stand united in solidarity in our disgust at the murder of Father Jacques Hamel in France, and in support of all victims of recent terror attacks. We understand that no vigil, or statement, or candle-lighting is sufficient to counteract the evil of evil people. 'We know that although this evil seeks to divide us and to make us turn on each other, we will not! As leaders from different faith traditions we say loudly we will build friendship and understanding against cruelty and hate. 'We stand together and shout out that life itself is sacred, and that no cause can be truly holy, until it chooses life over death. All religions must draw on the principles of respect and protection for all faiths. 'People stand united against Daesh's messages of hatred and will not be afraid. We stand together united in solidarity against all forms of hatred and extremism. They then observed a few minutes' silence and shared the sign of peace with one another. 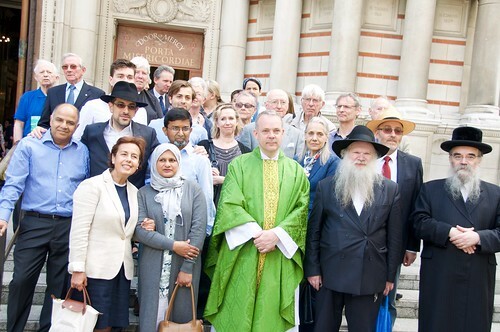 The vigil was organised by Faiths Forum for London.